South African newspapers have published images of President Jacob Zuma's residence, defying a government warning that this would break security laws. Mr Zuma's Nkandla residence is at the centre of a row after it emerged that the government had used $20m (£12m) of taxpayers' money to refurbish it. A group of South African editors described the warning as "absurd". The Times newspaper has the headline "So, arrest us", above a picture of the luxury thatched-roof compound. The Star newspaper has a photo of the homestead with a big red cross over it and the caption: "Look away! 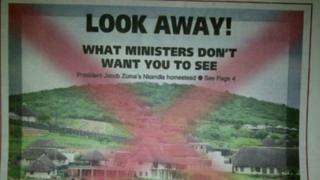 What ministers don't want you to see". The upgrades to Mr Zuma's private residence include a helipad and an underground bunker, which the government says are needed for security reasons. The contract is being investigated by South Africa's public protector, or anti-corruption watchdog, Thuli Madonsela, amid allegations that costs were inflated, and that the renovations went far beyond what the rules allow for a politician's private home. Earlier this month, security ministers went to court to try to block Ms Madonsela from publishing her report. "No-one, including those in the media, is allowed to take images and publicise images even pointing where the possible security features are," he said. "It is not done anywhere. We have not seen the images of the White House showing where the security features are. It is not done in any democracy." Following the publication of the photos, the government has issued a statement, saying that newspapers are within their rights to publish photos of the estate but "zooming into safety and security features... is a challenge as it compromises national security". BBC Africa correspondent Andrew Harding says the issue is an awkward one for the governing African National Congress (ANC), with elections approaching next year. He says it also touches on deeper concerns about the undermining of South Africa's young, but vital, democratic institutions.